During the mid-1940s and into the ‘50s, the All-American Girls Professional Baseball League captivated baseball fans throughout the Midwest. While America was at war and with many young men being drafted, Major League Baseball was at a standstill. Behind financial support from Phillip Wrigley, the women’s league was formed in 1943 and would last until 1954 when it disbanded. Hundreds of women took to the diamond and played America’s pastime at a highly successful level. In the first season, the league featured four teams. But due to the booming success of women’s baseball and rising attendance, the AAGPBL continued to grow. The league expanded to 10 teams during the 1948 season. Women were expected to be top-notch baseball players. Femininity, proper etiquette and attire were all vital qualities, as well. The players were even required to attend etiquette classes. Now more than 50 years later, many of these women remain active in the baseball community. Several former players are attending the 2011 MLB All-Star FanFest at the Phoenix Convention Center. Horstman played for the Fort Wayne Daisies from 1951-54, experiencing great success both on the mound and in the batter’s box. In her rookie season, she posted a 3-0 record along with a .256 batting average. The 1953 and ’54 campaigns saw her reach double-digit wins with 11 and 10, respectively. Her breakout season at the plate came in her final year when she batted a career-high .328 with 55 RBI and 68 runs. 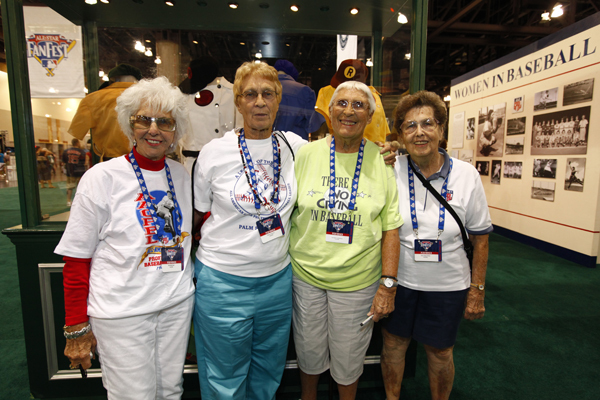 Hortsman, as well as Elma Steck Weiss and Maybelle Blair, are just three of the former AAGPBL players who sign autographs and participate in the FanFest festivities. Their group is also active during the Spring Training season. Blair and Weiss were teammates on the 1948 Peoria Redwings squad. Blair hails from Englewood, Calif., while Weiss made the journey from Oakland to Illinois to play baseball. The AAGPBL was undoubtedly a thrilling experience for all three former players, as their playing days were filled with fond memories. Blair, meanwhile, looks back at her pitching career with a bit of humor. Given her impressive numbers as a pitcher and hitter, Horstman’s career most likely featured many memorable performances and memories. However, she simply remembers her love for hitting.